UNDER CONSTRUCTION - The Rachel II- This beautifully crafted home offers the best in open floor plan living. 3 bedrooms/2 baths on first floor plus large 4th bedroom & full bath upstairs. Covered front porch perfect for rocking chairs, formal dining, bright open kitchen, granite countertops, stainless steel appliances, hardwood flooring in all living areas plus gas fireplace surrounded by built-ins. Master bedroom has illuminated trey ceiling & en suite luxury bath w/ceramic tile walk-in shower, large soaking tub & double bowl vanities. Enjoy entertaining on covered rear porch. Parsons Mill is New Hanover's newest planned community offering community pool & cabana & community park. No city taxes. Conveniently located off North College Road. Est completion 6/2019. USDA Eligible! 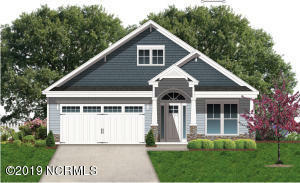 4431 Huntsman CT is a Wilmington HOUSE , with 4 Bedrooms & 3 Bathrooms. I want to go see this property in person! MLS# 100155704 at 4431 Huntsman CT . I have a question regarding MLS# 100155704 at 4431 Huntsman CT .
US-117 N/N College Rd, take exit 420B to merge onto NC-132 N/US-117 N/N College Rd, pass Blue Clay Road, entrance to community will be on the left.